With the holidays and all their junk food behind us, a lot of us are trying to remember how to eat healthy like we did in October. Some are turning to cleanses, and there are many to choose from—juice cleanses, raw food cleanses, even lemon juice and cayenne pepper cleanses. But none of those sound very appealing to me. Luckily, I found a cleanse I can get on board with: The Taco Cleanse. The Taco Cleanse: The Tortilla-Based Diet Proven to Change Your Life, is my new favorite cookbook. Written by a group of hilarious people (er, taco scientists) from Austin, Texas, it offers a new, taco-based way to eat, as well as many tools and pieces of info to help along the way. The book includes recipes for a wide variety of vegan tacos and taco parts: tortillas, fillings, condiments, and Artist Tacos—complete taco recipes you can use “as training wheels before assembling your own taco creations” from the other sections of the book. Also included is a category called Supplements, which are alcoholic beverages to enjoy with your tacos. While the recipes are certainly the best part of The Taco Cleanse, I also appreciated the accompanying information. Before you get started with your cleanse, the authors make sure you know what a taco is, what the benefits of a taco cleanse are, and who should take part (hint: everyone). You can also take a quiz titled “What Kind of Taco-Eater Are You?” I’m a Taco Adventurist, in case you were wondering! Okay, back to the food. I made the Wake and Shake Scramble, with a couple changes, which must be my Adventurist coming out. 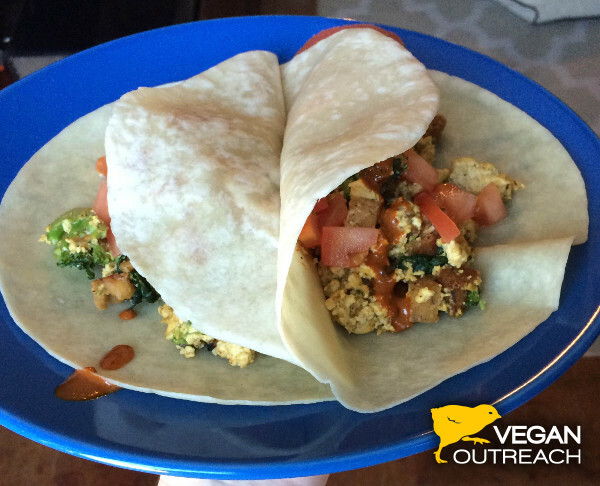 I love a good tofu scramble, and it turns out it’s even more delicious in a taco! The cookbook authors recommend adding their “Living” Chipotle Sauce and Tempeh Bacon, which I did and am very glad. This was without a doubt one of the best tacos I’ve ever had, and I’m so excited to try more. I’m particularly excited to try the Tater Tot-cho Tacos, Energizing Dutch Waffle Tacos, and Chocolate-Raspberry Dessert Tacos. 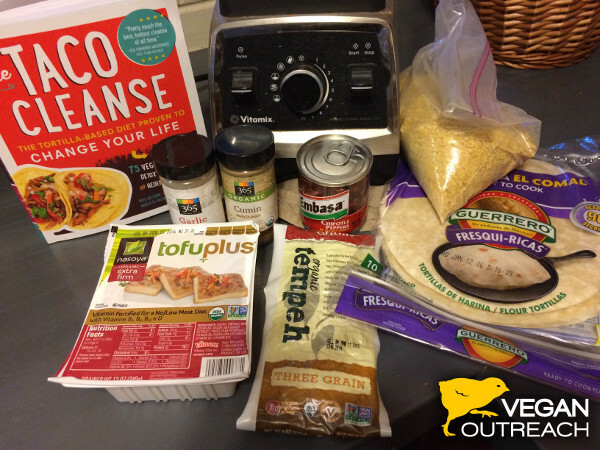 I highly recommend The Taco Cleanse, and you can get started now with the recipe below! Enjoy! What started out as a way to use up leftover corn tortillas has become a staple of brunch tables. Migas tacos are transformational because they contain two superfoods: corn and flour tortillas. If you’ve been afflicted with collywobbles or gripe, try eating at least one migas taco a week. Because your homemade corn tortillas are probably too delicious to leave any leftovers, tortilla chips stand in here. Heat the oil in a large sauté pan over medium-high heat. Sauté the onion and jalapeño for 2 minutes, or until the onion starts to soften. Crumble the tofu into the pan and sprinkle with the salt, cumin, and pepper. Cook until the tofu is dry and browned on at least one side, about 10 minutes. Try not to stir too often as this prevents browning. Add the rest of the ingredients, including the cheese if you’re using it, and stir thoroughly. Cook until the tomato softens and the liquid is completely absorbed. Serve in the flour tortillas.